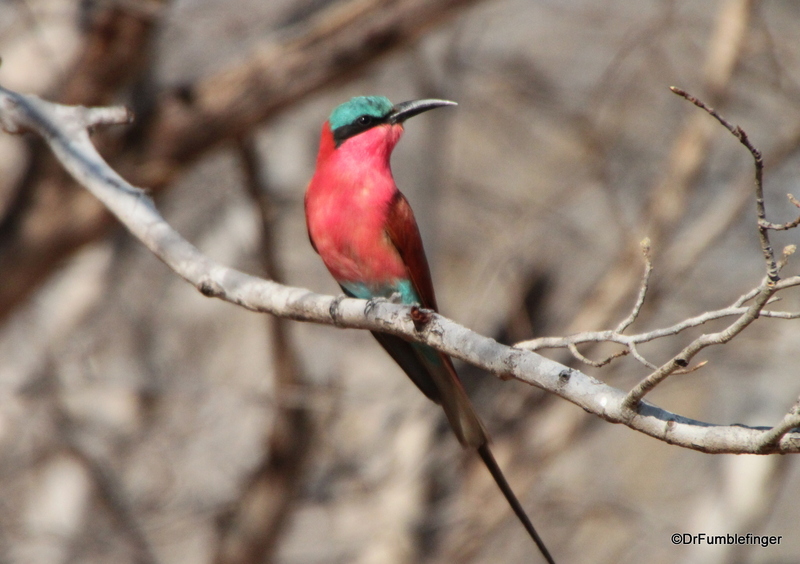 Among many wonderful memories of being on safari in Botswana are those of its many magnificent birds. These include our featured subject, the saddle-bill stork, which lives in sub-Saharan Africa. These are huge long-legged birds, attaining a height of almost 5 ft (150 cm) and weighing up to 17 lbs (8 kg). The birds have a wingspan of up to 9 ft (2.7m), so they are easy to spot at a distance. They are tallest and most vividly colored of Africa’s storks. The tend to live on at the edge of forests, where they have access to tall trees (on which they build their nests) and marshes (wherein they feed). Their diet includes fish, beetles, frogs, reptiles and small mammals. Elephants have fascinated me since I was a child. You can enjoy them at the circus, in documentaries and zoos, but to really appreciate elephants you need to observe them in the wild. They are majestic and entertaining, and will capture your full attention. Their cute little ones will steal your heart. It’s fascinating being atop Table Mountain, the mountain that dominates beautiful Cape Town in South Africa. There’s an easy and a hard way to get atop the mesa of that mountain. The hard way is to walk up — steep grades and a significant verticle gain. The easy way is to do what we did — take the cable car to the top. There’s something about the presence of a lion that tickles the primitive warning centers of our brain. I guess it’s the old “prey” warning in us, because the hair began to rise on the back of my neck when I saw these paw-prints in the sand. Rhinos are rare and endangered animals, as most people know. Hunted to near extinction for their horns — used in traditional Asian medicine and for making dagger handles — they now mostly survive in protected areas and zoos. They’ve made a modest comeback, and hopefully the trend will continue. The Victoria Falls Hotel, built in 1904, was the first hotel in Victoria Falls. Visiting it today takes one back to the days when travel was a grand adventure, and to stay in a lovely colonial establishment like this was icing on the travel cake. Luxury, charm, fine food and service — this place had (and still has) it all. Besides the grand entrance seen above and its inviting verrandah, the halls of the hotel are filled with historic drawings, photographs and paintings of that bygone era. One of the most beautiful birds I’ve seen in years is the scarlet-breasted bee-eater. 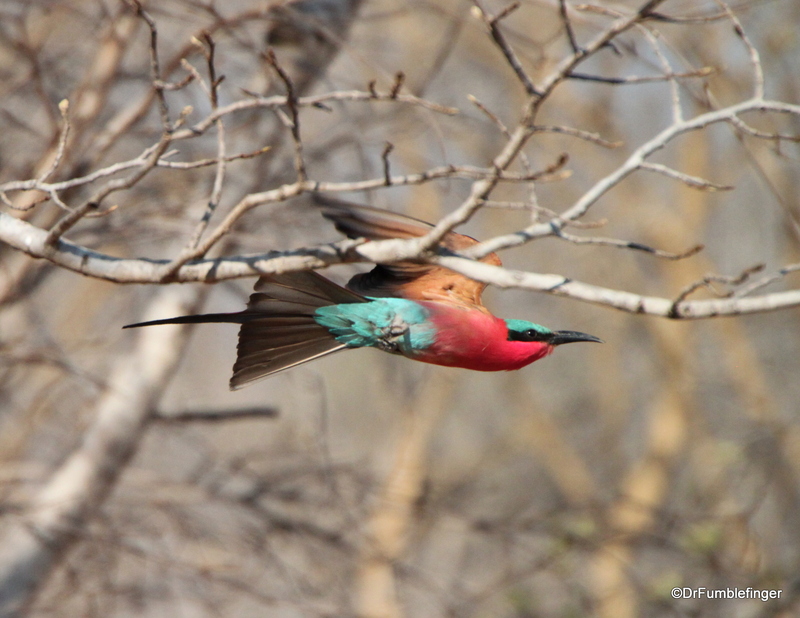 These birds were quite common in Botswana, especially in Chobe National Park, and they’d often flash by us pursuing insects (they really are bee eaters). This particular bird was a poser. He sat in a branch near our vehicle while on a game-drive and let us take as many pictures of him as we wanted. Then, in a flash of color, he was gone, although I got a decent photo of him on his way out. One of the most memorable half hours I’ve ever spent on safari was watching this herd of buffalo cross the Okavango Delta. It was just before sunset and the light was soft and magical, what John Steinbeck liked to call, “the hour of the pearl”. We approached the buffalo herd downwind so they couldn’t pick up our scent, but they were aware of our presence. The larger, stronger animals came to the front of the herd and made a living wall between us and the smaller and weaker buffalo. There they stood, trying to see us (they have bad vision) and smell us, and we sat back taking it all in, enjoying this magnificent spectacle of nature!